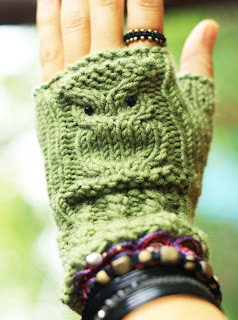 After getting a severe case of knitting fever, I started scouring the web for all things knitting related. While reading the lovely Villakettu blog I stumbled upon these lovely little dudes taken originally from the issue 21 of the awesome crafts magazine Mollie Makes and it was love at first sight. I don't know what it is about owls that makes them so adorable. I don't usually go with the fashion fads but I have to admit that you can sell me pretty much anything (or at least get a swooning "ooh") if it has owls in it. So yes, I worked out how to use Zinio, bought the e-version of the magazine and... and nothing. I was miles and at least one ferry trip away from the nearest place where they sell yarn and knitting needles. The only knitting needles I had managed to buy from Kuala Lumpur on our last trip there were circular needles (what was I thinking?) that weren't suitable for knitting wrist warmers. So I had to wait. But I had a cunning plan: my boyfriend's relatives were coming for a visit over Christmas, and they had suitcases just for transporting me some yarn and needles! Well, not quite, but you get the picture. And after a text message to my boyfriend's mom and a couple of weeks of excruciating waiting, I finally had my 5 mm double pointed needles and lovely 2 balls of green Drops Big Merino. Yay! 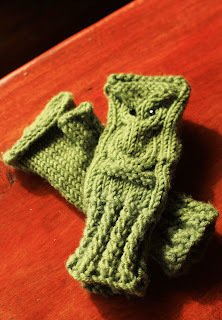 The wrist warmers were pretty easy to knit and they were my first project with cables. The only problem, that also Anu from Villakettu had noticed, was that the wristwarmers were meant for a person with really tiny hands. I could get them on, but the poor owls looked so bloated that I decided it was better to give them to my boyfriend's cousin as a christmas present. The Epic Gauge Failure and Happy 2013!